Most residential properties across Creston, Wadsworth, Strongsville, Medina, Norton and Wooster have some type of landscaping elements on their property. While some are designed with very basic features such as lawns, trees and shrubs, others are very elaborate, and have water features, flower beds, decorative masonry elements etc. 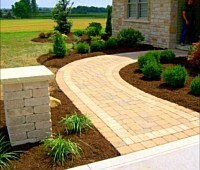 The Stoney Creek Landscaping experts believe that a great-looking landscape is never a matter of chance. It takes a great deal of careful planning to ensure the landscape design concept is carried through in the actual installation. Some property owners in Barberton, Seville, Orville, Brunswick, Cuyahoga Falls and Green call us for landscape design& installation upgrades. They tell us that their existing garden and yard designs didn’t turn out the way they had envisioned them. This is a very common issue and it typically occurs because the company that handled the job for them hadn’t provided them a clear idea about what the landscape would look like, once it was installed. We are the professionals that like to do things differently. We understand that our clients want to be able to see how these outdoors spaces will look, once all the features are in place. This is why we use the latest 3D Design software in our work. This helps us provide customers virtual 3D images that give them a perfect idea about what their landscaping will look like. When you call us with your requirements, our design planning team members come over to your location and survey all the outdoor spaces. They understand what your requirements are, conduct a detailed discussion about what your vision for the space is, the design theme you want to maintain and the kind of elements you want installed. Keeping all these aspects in mind, you will be provided 3D designs which provide you very vivid pictures of how your garden is going to eventually look like. Clarity about how the landscape will look with reference to the structure of your home. This means you save a significant amount of money as any tweaks you need in the design can be incorporated before the actual work starts. As you can see, there are a number of benefits to3D landscape designing. We work very closely with you, provide the solutions you need, use the best materials & workmanship in every project and ensure the job is completed to your 100% satisfaction.